J.K. Place Firenze stands in the heart of historic Florence, on Piazza Santa Maria Novella no less, facing the marble façade of the great Gothic church. 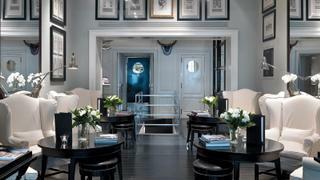 But the boutique hotel, while right at home in such grand surroundings, is a world apart in so many ways. Step off the piazza and into the elegant townhouse and you begin your travels, in taste and time. An aristocratic British country residence is immediately brought to mind in the reception, which is located in a splendid library of geometrical black woodwork. In the lounge, numerous stylistic philosophies are harmoniously joined together: a Charles X fireplace, stately neoclassical bookcase, animalier armchairs and 1950s lamps. You could easily be in one of the stately Georgian residences in London’s Piccadilly. Breakfast can be taken in what was once the building’s internal courtyard, paved with grey sandstone and covered with a glass structure that shows off the clear form and elegance of the ancient architecture. The refined, sophisticated and contemporary interior is the work of Michele Bonan, a Florentine architect and designer of private estates and several motor and sailing yachts as well as hotels. 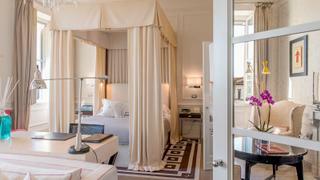 Bonan has ensured that despite its 20 charming rooms, seductive J.K. Lounge Restaurant and Bar, and the stunning setting of the J.K. Terrace, J.K. Place Firenze feels as much a house and home as it does a beautiful boutique hotel.